Per diem charges are applicable when cargo /containers are held in carriers possession beyond the applicable free time at the request of the shipper/consignee or because of insufficient documentation from the shipper/consignee. Per diem charges are not applicable when cargo/containers are held in carriers possession beyond the applicable free time at the discretion and benefit of the carrier. Carrier and/ or agent may refuse shipment or delivery of containers/cargo for which storage or others charges are not paid. Abandoned Cargo: Any cargo remaining in the warehouse or on the terminal in excess of 90 days shall be considered abandoned by all cargo interests. Abandoned cargo shall be subject to sale by Hyde Shipping Corporation as payment of all outstanding fees and costs consistent with the rates as set forth in the tariff. Hyde Shipping Corporation shall give 15 days advance notice of the sale by publishing said notice on the Hyde Shipping Corporation website. (www.hydeshipping.com). All sales will be final. Without limiting the forgoing refrigerated cargo will be considered abandoned after 15 days with notice and sale to be provided consistent with the same terms stated herein. Refrigerated or other perishable cargo will be accepted for storage solely at the Shipper’s Risk and Shipper shall indemnify and hold Carrier, Agent, and Terminal Operator and any and all contractors for the Carrier harmless from any and all liability and expense for such damages that might result from storage conditions unless caused by the negligence of the Carrier , Agent , Terminal Operator or any other contractor for the Carrier. Vehicles without title or booking in advance will NOT be received by Port Everglades Terminal. Vehicles with booking and no title will be received at Port Everglades Terminal. Vehicles with title and no booking will be received at Port Everglades Terminal. Vehicles with salvage or parts only titles will be received and shipped at shippers/consignee risk. Claims for these vehicles will not be accepted. Upon expiration of freetime , Carrier may place the cargo in another facility with all charges associated with the transfer and storage for the account and risk of the shipper. Vehicles with salvage or parts only titles or nonrunning will be shipped on a “prepaid “ basis only. Rolling stock, vehicles, boats , break bulk-14 days. FCL-dry cargo-Five (5 ) calendar days beginning the day after discharge . If container is placed on U.S. Customs exam /hold consignee shall have an additional two(2) days. FCL –refrigerated –Three (3) calendar days beginning the day after discharge. Tank containers -$50 per day. Shipper owned equipment -$20 per day. Vehicles that are received for export at the Port Everglades Terminal and are subsequently delivered back to the shipper or another third party and are NOT exported shall be assessed an IN/OUT FEE of $100 per vehicle which includes unvalidation if necessary. 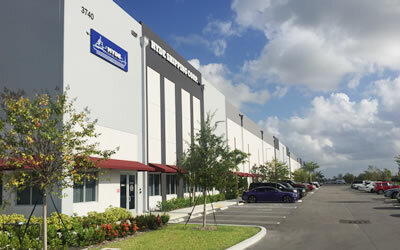 Cargo that is received in the Port Everglades Terminal or Miami Warehouse and subsequently requires maintenance and/or repair (such as battery replacement or charge or recoopering of crate or tarping etc.) labor will be charged at $75 per hr. plus materials at cost plus 15%. LCL or LCL for consolidation to FCL- $.10 per CWT or $.05 CFT whichever is greater with minimum $5.00 per dock receipt per day. LCL cargo that is received for export at the Miami warehouse and is subsequently delivered back to the shipper or another third party and is NOT exported shall be assessed an IN/OUT FEE of $20 W/M per 40 cu. Ft or 2,000 lbs. whichever is greater with a minimum of $25.